We spent the whole of our student loan on battels and we’ve got £10 to last the term. Only one thing for it. Lifestyles takes on the world at work. Job Description: Entertain and amuse the tourists while showing them the finest Oxford has to offer. Skills required: Wit, energy and enthusiasm, and a total disregard for traffic. A certain degree of knowledge about Oxford. You must have seen a walking tour around Oxford: they cause mayhem disrupting the flow of traffic, or appear before your college window in alarmingly large numbers with cameras at the ready. 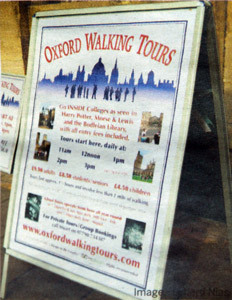 The signs advertising their various merits lie around Oxford: the bus tour is the Rolls Royce of tours, while the Oxfam tour caters to those who want to save the world while undertaking a walking tour. I opted for Oxford Walking Tours, I had often seen their employees outside Trinity on Broad Street and they also offered the chance to go inside colleges (specifically those of Harry Potter , Morse and Lewis ). Stuart welcomed me with open arms onto the tour. His gelled back hair showed serious tour guide intent, and I became an interesting prop: ‘Today we actually have a live living Oxford student on the tour, so he might be able to tell you about his college.’ The nature of the tour seemed to be divided between explaining the history of Oxford and describing the experience of a present-day student. Anecdotes and interesting facts are always present. A sculpture of Maurice Bowra in Wadham provides an opportunity to retell one of his witticisms; a portrait of Spooner in New means the opportunity to say many spoonerisms. To strive to obtain the perfect balance between humour and learning is the tour guide’s aim. There are other ways that a tour guide shows his talent. The able tour guide must transport people across roads and through busy thoroughfares, avoiding other tour groups; they must combat the aggressive weather elements by stopping to speak only indoors or under shelter. Stuart was a master at his art, a seasoned professional. He explained to me that no two tours are ever the same, and I soon began to see the role of improvisation in his art. The whole history of the town lay behind his eyes as he calculated where and how to pause, which anecdote to mention, which colleges he could visit and when. He was also abreast of current developments in Oxford. A particularly stylish touch was a quiz question for the younger members of the group on Harry Potter as we stood in the cloisters at New, which contained a trick question easily sidestepped by a young fan. I knew a little about the history of my own college but coming away from the tour I felt like there was now more of a connection with the buildings that surrounded me. The tours should not be just for tourists but also for students. Stuart informed me that he has in the past employed students during the holidays, and for those with the accommodation, it could be the perfect job. You can talk the talk but can you walk the talking walk?